Developed by the military and intelligence agencies, red teaming is a revolutionary way to stress-test strategies, flush out unseen threats and missed opportunities and execute more successfully in an increasingly uncertain world. Red teaming can help any company plan better, anticipate emerging threats and avoid potentially disastrous mistakes - from mistimed product launches to ill-conceived acquisitions. Many of these same approaches have been organically incorporated into the decision-making processes of today's most sucecssful companies, from Amazon and Google to Ford and Toyota. As the first civilian to graduate from the US Army's elite red team leaders course, Bryce Hoffman is uniquely placed to reveal a clear set of tools and techniques that will enable every company, department, team and organization to adopt this game-changing method into their business too. 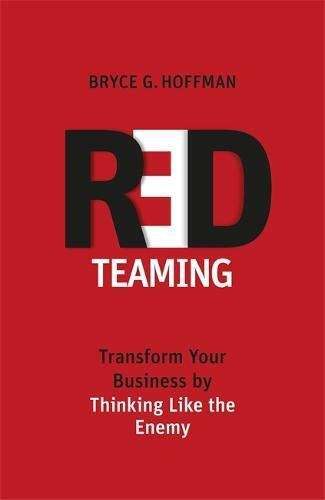 By embracing red teaming, managers, leaders and aspiring leaders in companies of every size and in every industry will be able to plan better, compete more effectively, innovate more proactively, and make their businesses one of the disruptors in the marketplace, rather than one of the disrupted. Don't get left behind.